I began watching Martha Stewart back in the 90's. 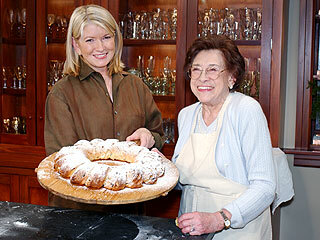 This was her original television show called Martha Stewart Living. I think it ran until 2004. I was never a big fan of her more recent show on the Hallmark channel that was taped before an audience. In my opinion, she shines more when she is working alone. I think I've always appreciated order in a home. In a small home with that many little ones, disorder and chaos would have been the death of me. I think she helped to teach me the beauty of simplicity. We were able to create a lovely home with very limited funds. We didn't have satellite television at that time and so I didn't have the Food Network to watch. But I loved watching her prepare recipes. I still use several of her recipes today such as her Dirt Cake. It looks like a potted plant, but it's actually a dessert with cream cheese, pudding and oreo "dirt". 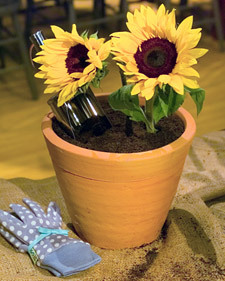 Courtesy www.marthastewart.com under "Jane's Dirt Cake"
You can still purchase dvd's of her original program on ebay or Amazon. Her Thanksgiving dvd is still one I like to watch once a year and try ideas for recipes or decorating. If I could give her advice (not that she needs it) it would be to get back to what made you popular to begin with. Don't do a show with a television audience - you don't need it. Get back to just you alone or you and one guest preparing a meal together or setting a table for family for Thanksgiving. That is where you shine. I'd also want to say "thank you" for helping teach me about making my house into a home:) I miss you, Martha!